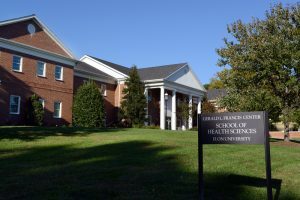 Elon University’s School of Health Sciences is located at the Gerald L. Francis Center at 762 East Haggard Avenue. The Francis Center is located on west campus. Visitor parking is on the east side of the building. Turn right onto Boone Station Drive and then immediately left at St. Mark’s Church Road. Follow this road for 1.4 miles. Note the road’s name changes to Williamson Avenue after crossing South Church Street. You will cross railroad tracks as you enter campus. Turn right at the stoplight onto East Haggard Avenue and follow this road for about 1 mile. The Gerald L. Francis Center is on the left.